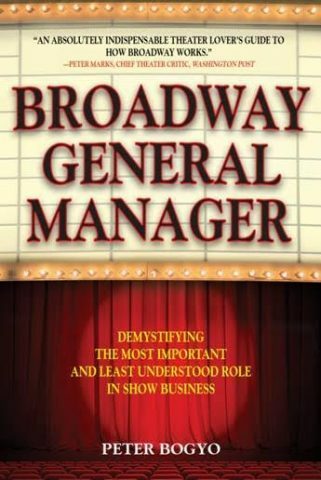 Peter Bogyo's Broadway General Manager handbook is a detailed look into the ins and outs of perhaps one of the least understood roles in American Theatre. This award-winning General Manager of such productions as Love Letters and American Buffalo among others has carved out a niche for himself as one of the key players in the business. Bogyo's journey to find his dream job took a couple of turns -- starting out as a performer until he finally found a position that combined his mathematical prowess and great attention to detail. Having been in love with theatre since the age of five during his kindergarten production of The Nutcracker, he is an unsung hero of the trade; the vast amount of detail he describes that goes into a planning Broadway show serves to remind us why so few productions actually make it to the Great White Way. Bogyo has crafted an easily understood, step-by-step process for the all the young potential GMs out there starting, with the production budget, giving a master class in negotiation, insurance, employees, financial reports and more. It is a text book that will be sure to have a life in theatre schools nationwide. The devil is in the details, and Bogyo has been very specific and open in sharing his knowledge with colloquial language and entertaining anecdotes. He has even included a handy glossary at the end for those new to the business to refer to. Ultimately, Broadway General Manager is a text that is both necessary and welcome at this stage in our understanding of “the business”. As Broadway shows get bigger and more expensive with newer and newer technological advances to woo the audiences, the need for the referee of theatre will grow and Bogyo’s book is certain to serve as a bible for the trade moving forward.